SPIRIT Magazine is Central Canterbury’s very own, full-colour lifestyle magazine, which has been in circulation since 2007. We’re passionate about celebrating everything that happens right here; amazing people, events and fantastic businesses. These are the stories that fill our pages. SPIRIT Magazine is packed to the rafters with local stories and events, interviews, restaurant reviews, recipes, what to do guides, health and lifestyle advice, shopping inspiration, home and garden features, as well as motoring, books and competitions, we highlight all that makes our region a special place to live. Experts in such fields as property, gardening, health and beauty and interior design write our columns – familiar faces offering first-rate advice based on local knowledge. Our region is just buzzing with new and exciting things to do and places to go, and the choices are expanding by the day! No matter if you’re new to the district or a long-time local; you’ll be surprised at how much we have going on right here on our very own doorstep. Discover new places to enjoy a family outing, delicious new places to eat out, the local markets and fabulous git ideas or just curl up with a coffee and enjoy a great local read. SPIRIT Magazine provides all the food, and the food for thought you could wish for! More than 20,000 copies of SPIRIT Magazine are delivered every month, and if you have family and friends living elsewhere, send them a subscription and share the SPIRIT Magazine with them. SPIRIT Magazine is your magazine, so contact us any time. Let us know if you have, or know of, a great story for us to share, tell us what you’d like to see in these pages, and DEFINITELY tell us what you think of our publication. We love it, and we hope you do too! Over 20,000 copies are delivered free to residential and rural delivery addresses throughout Mid Canterbury: Ashburton, Rakaia, Methven, Hinds, Rangitata and Geraldine as well as Leeston, Southbridge and Rolleston. You’ll also find us in local cafes, restaurants, galleries and businesses including The Ashburton Arcade, McDonalds, Fusion Gallery and Harvey’s Bakehouse in Ashburton; Café 131 Methven, The Red Shed Gallery Rakaia, Take Note Leeston and The Pin Tin Geraldine. 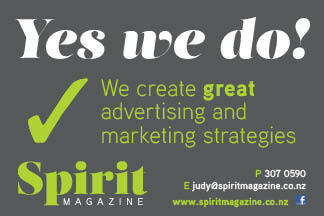 Spirit Magazine is a free, monthly lifestyle magazine based in Ashburton, and delivered free to homes and businesses. It’s your local magazine, keeping you informed about where to go and what to do around the region.